Group, Company and Incentive Events: Adrenaline Guaranteed! Get ready for a different sort of event, unlike anything you have experienced before. MiGFlug offers a variety of events optimally suited as group tours or company outings. Nothing like any of you have done before comes even close. Nothing like anyone of you will ever forget. Be it as a private group like friends and family, for a stag of the other sort, a sales incentive or a company event: We have fantastic possibilities for different group sizes from different locations. Our group tours are ideal for a company outing or as a company incentive. One highlight is the „Red Skies“ group tour: A group of up to 10 people fly with an Antonov AN-2 to one of our locations. Each participant can fly a jet for themselves, while MiGFlug organizes catering and an adequate supporting program. In Riga/Latvia and Dijon/France, we have regular events for groups. Flights are in a formation with a famous jet display team. You will be as close as 4.5m from the next jet, while they are performing thrilling aerobatics at a high speed. Then the formation will break and all participants get some stick time and more individual acrobatics. We have 6-7 jets on both locations, and can easily fly 20 participants per day. Sometimes around airshows, these events can also take place from other locations all over Europe. Want to learn more? Contact us. MiGFlug naturally guarantees absolute discretion and on request can offer CO2 compensation for the flights. Our offers are in conformity with the high corporate responsibility requirements of our clients. For smaller groups, we can do events in all our locations. That is usually limited to around 4 participants per day. Contact us for specific details. Got a strong stomach? Try the Air Combat program in jets. You will be two participants who do a training and then engage in aerial battle in a real jet, flying missions against each other. Larger groups on request. Learn more here. Also, any event is also possible for two, in any location we offer. In Italy, Dijon/France and Riga/Latvia you can fly in formation. In all other locations you can do all preparations together – then one flight will take place after the other. Of course, you can book a fighter jet flight at any time. For customers that prefer to take part in a large event, we offer special events at irregular intervals. We inform our customers via Facebook, Instagram, Twitter and email about upcoming jet events. 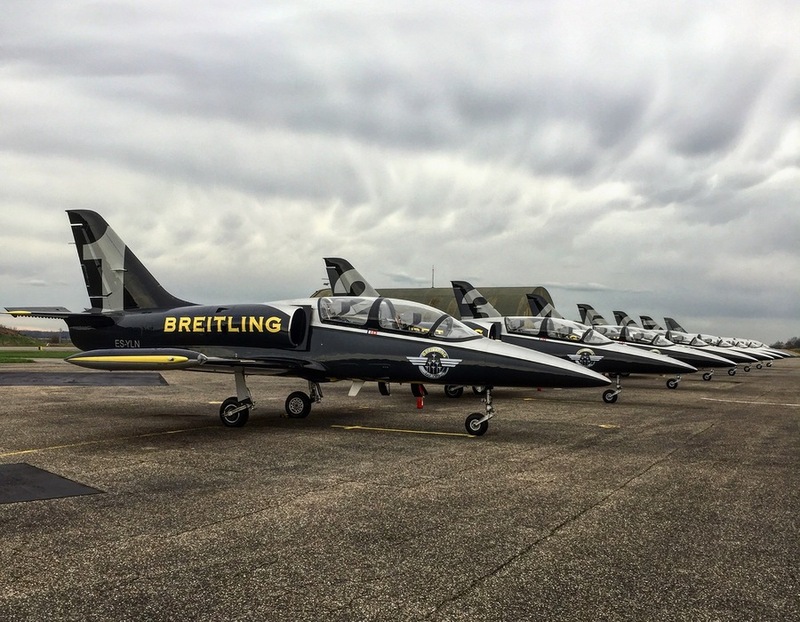 You can for example regularly join a group event including incredibly intense formation flying with the well-known Breitling Jet Team and other jet teams all over Europe. If you would like to learn more about these events and get onto the waiting list, please contact us. Whatever you are looking for, you best contact us to get an idea what we can do for you. The experience and organization has been amazing, just perfect. We booked a formation flight in Riga for our team event this year. Words can't describe this. You fly 4m from one another, in formation, at very high speed! 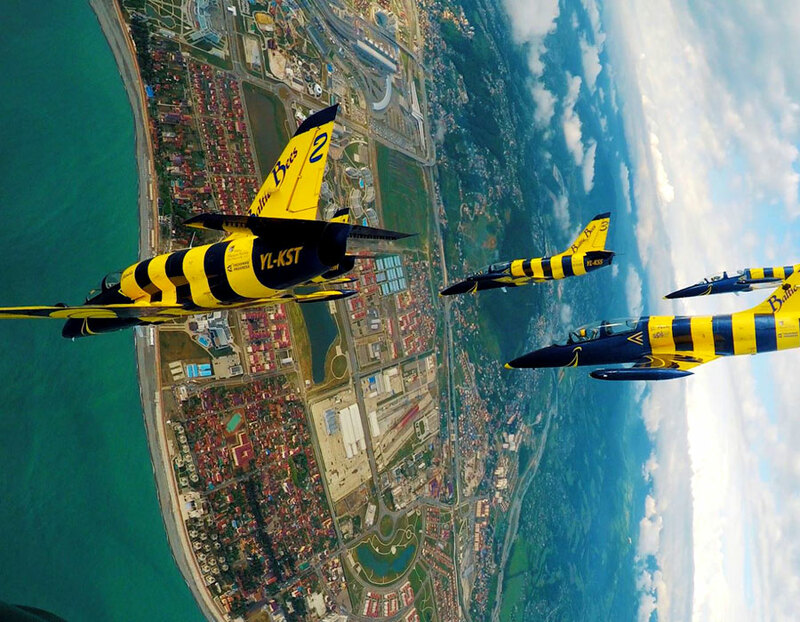 All kind of insane aerobatic maneuvres. Crazy... In the end you split off and you can also control the L-39 yourself. What an aircraft. Thanks to MiGFlug and the whole team in Riga!